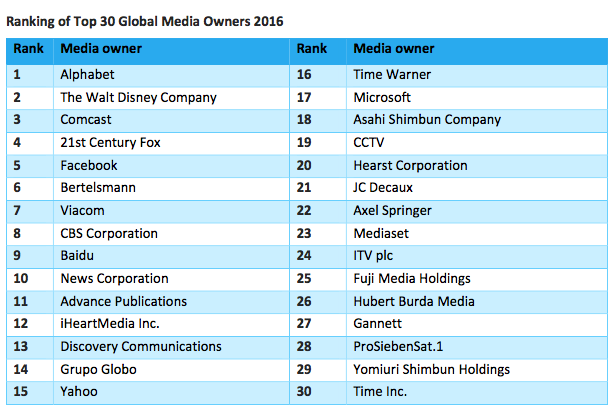 Google remains the biggest media owner in the world and has extended its lead over second-placed Disney in the latest rankings. 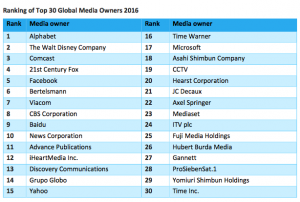 ZenithOptimedia compiles the roster of the world’s top media owners and issued its latest findings this morning. Google holding company Alphabet was the clear leader, ahead of Walt Disney. The internet giant was 136% larger than Disney, a 21% increase on the previous year. Zenith measures companies by media revenue, which covers all sales relating to advertising. Digital firms continue to displace their traditional media counterparts on the list; Facebook, Baidu, Yahoo and Microsoft all feature in the top 30 and have each moved up in the ranking. Facebook is the fastest growing media owner in the list recording a 65% increase in media revenues year on year. Baidu and Google are the second and third fastest growers as digital ad spend continues to registers sharp increases. “Faced with stagnant revenues from their core businesses, traditional media owners have invested in their digital activities, either expanding digital extensions of their existing brands or creating new standalone digital products,” Zenith noted. Jonathan Barnard, Zenith’s head of forecasting said: “The traditional media owners in our top 30 ranking have been scrambling to scale up their own digital businesses, to various degrees of success.